Simone Guo leads an illustrated talk (in English with Mandarin translation available) on the aesthetic differences and similarities between Western and Chinese art historical painting. A selection of images will provide a review of Western painting from the Middle Ages to late 19th century and Chinese painting of the corresponding historical periods. This informal talk will also be an introduction on “how to look at painting” in context of different cultural and art histories. and referencing certain artworks seen in Adad Hannah’s The Decameron Retold. Free session, but due to limited spaces registration is required at Eventbrite. Simone Guo was born in China and is part of an artistic family. She studied at Central Academy of Fine Arts in Beijing, China where she completed a Bachelor’s and Master’s degree in Art History, and in 2004, earned another Master of Art History degree from the University of Victoria. For the last ten years, Guo has shifted her focus to studio practice and is currently represented by Art Beatus (Vancouver). Her work can be found in collections in Asia and North America. Please reserve your tickets here. 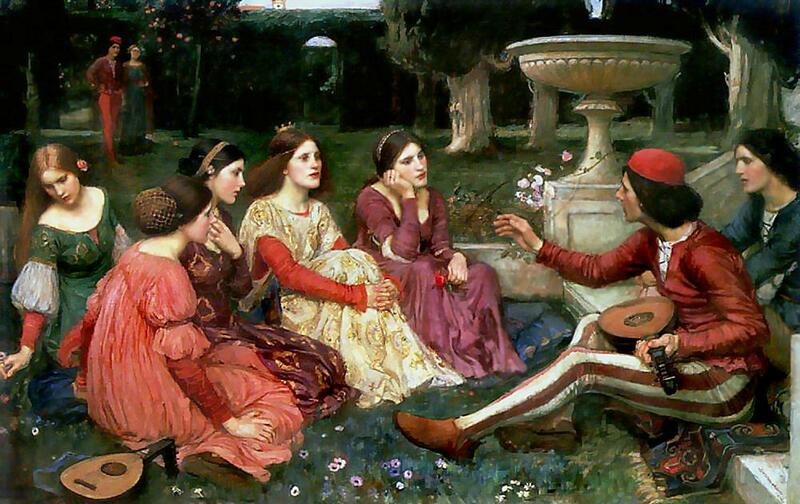 Above: John Williams Waterhouse, A Tale from the Decameron, 1916, oil on canvas. National Museums Liverpool.